At opening of cabinet meeting, PM Netanyahu speaks about 9/11, incitement on social media, social services reform, and the Paralympics. "Today we mark 15 years since the terrorist attacks on 9/11. We remember the victims. We embrace their loved ones. We stand with our greatest ally, the United States of America, and with other partners in the battle against militant Islamic terrorism that spreads fear, dread and murder around the world. Our memories are long, our determination is boundless. Civilized societies must band together to defeat these forces of darkness, and I'm sure we will." Netanyahu focused on the fight against terror on the social media front. Security experts have repeatedly warned that Facebook and Twitter are being used by terror groups to spread incitement to violence. "The fight against terrorism is also being waged on the social networks, and a senior delegation from Facebook is currently in Israel. The goal here is to improve cooperation against incitement, the incitement to terror and murder, on the social network. The Internet has brought considerable blessing to humanity, but – to our regret – it also carries a curse, because terrorists and inciters are using the Internet to attack mankind. We are determined to fight these phenomena and, therefore, I welcome the cooperation, or at least the desire for cooperation, that Facebook is showing, and we hope that these will lead to better results." Next was the topic of reform in the social services. 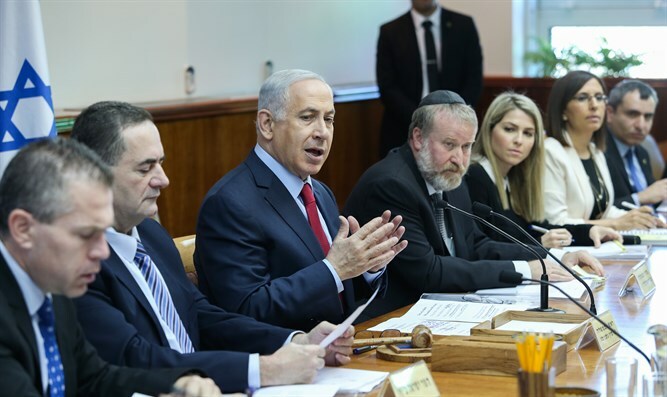 "Today, the Cabinet will approve a process to improve the social services that the Government provides to the citizens of Israel, by outsourcing these services. This was raised as a main subject by the Trachtenberg Committee and today we are implementing it. We will see to it that the tenders for the social services of the State of Israel, for the citizens of Israel, concentrate on the best result for the citizen – the citizen is at the center. I would like to congratulate all those who were involved in this important step – the ministers of Finance, Health, Social Services and Social Welfare, Immigrant Absorption, Education and Justice, as well as those third sector non-profit associations. Thank you to you all. This is an important moment and, I think, an important turning point as well." Last, but not least, came the Israeli Paralympic athletes. The Prime Minister made sure to praise their accomplishments in getting the games off to a good start. Israel has historically had far greater success at the Paralympics than at the Olympics. Netanyahu urged the nation to pay attention and support the Israeli delegation. "I would like to congratulate the Israeli athletes at the Paralympics. They represent the Israeli spirit at its best. I call on the citizens of Israel to watch the games and see our athletes. Israel television broadcasts any live broadcast of all Israeli athletes participating in these games. There is also a daily half hour summary, and we are now working to try to bring the games to everyone on the internet. Watch the games, support our athletes. They are simply heroes. Good luck to them."